First retrospective of influential artist collective Bow Gamelan Ensemble (Anne Bean, Paul Burwell, Richard Wilson). Embodying an urgently creative and discursive space resonating with improvisation, camaraderie, provocation and antagonism, Bow Gamelan Ensemble is driven by the uniquely subversive and collective sensibilities of Bean, Burwell and Wilson. 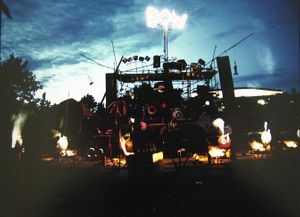 Charged with their individual virtuosity in performance art, avant-garde music and kinetic sculpture, Bow Gamelan Ensemble’s sound installations and performances are immersed in an orchestra of instruments made from scrap metal, electric motors, river barges and domestic objects including glass sheets, light bulbs and fireworks. With this passionate and radical sojourn in the possibilities of sound and light, Great Noises that Fill the Air will engineer a live interrogation of the dissonance between ‘noise’ and ‘meaningful utterance’ that will astonish the ears and ravish the imagination with unearthly magic. 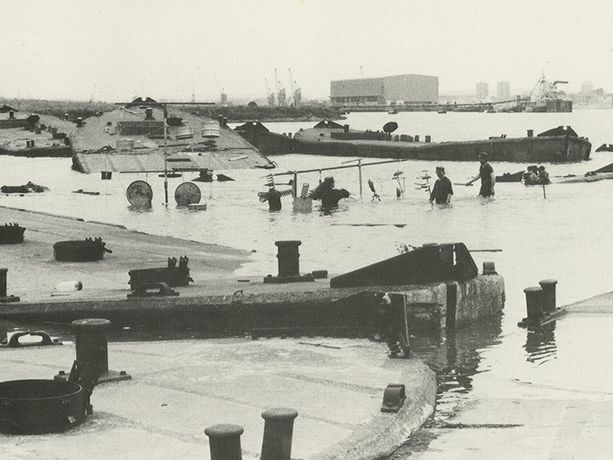 At the loud heart of Great Noises that Fill the Air will be a radical take on archival display. Drawn from sketches, photographs and ephemera from Bow Gamelan Ensemble’s archive and placed on music stands, this interactive installation will act as a ‘symbolic score’ heralding new ways of perceiving and creating sound. Underscoring the tumultuous din of their experimental collaborations will be The Thundersheet. 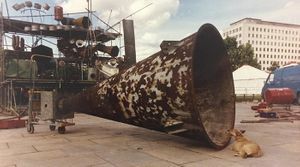 This newly commissioned kinetic sound sculpture and collaborative acoustic instrument will be activated live by Anne Bean and Richard Wilson at the opening ceremony of the exhibition filling Cooper Gallery with a vast spectrum of sound rippling on the cusp of meaning. Underpinned by Bow Gamelan Ensemble’s ethos and practice, an Event Series will transform Great Noises that Fill the Air into an open ‘jamming studio’, where artists, musicians, poets and audiences will share, debate and question strategies of collaboration and antagonism in culture, society and everyday life.